APA is one of Japan’s most famous, low cost business hotels. They own and operate over 300 hotels and resorts in Japan as well as 40 locations in North America. APA hotels and resorts include amenities such as spas, hot springs, restaurants, and more. 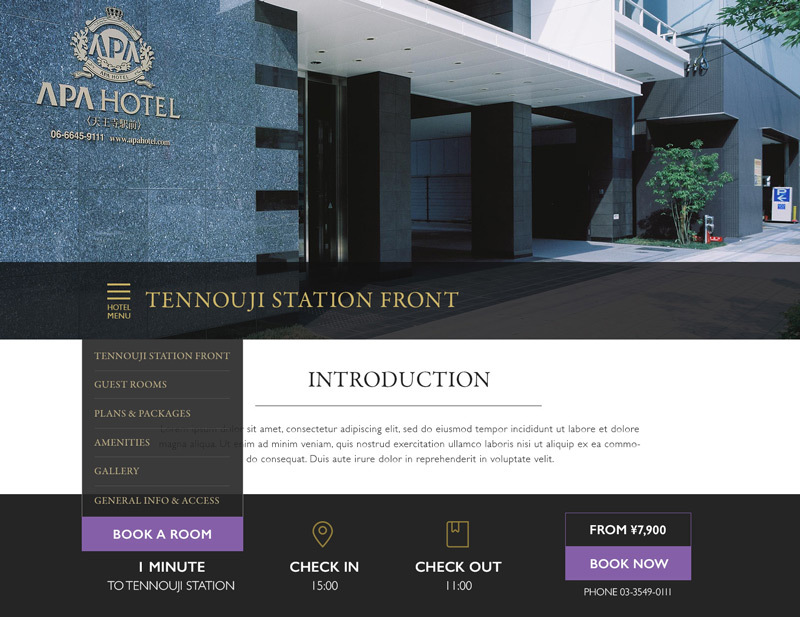 To appeal to the ever-increasing influx of foreign tourists in Japan, APA needed a modernly-designed English website, a boost in the overall visual feel and aesthetic, and a content strategy that answered the needs of its potential guests in an intuitive and customer-centric way. 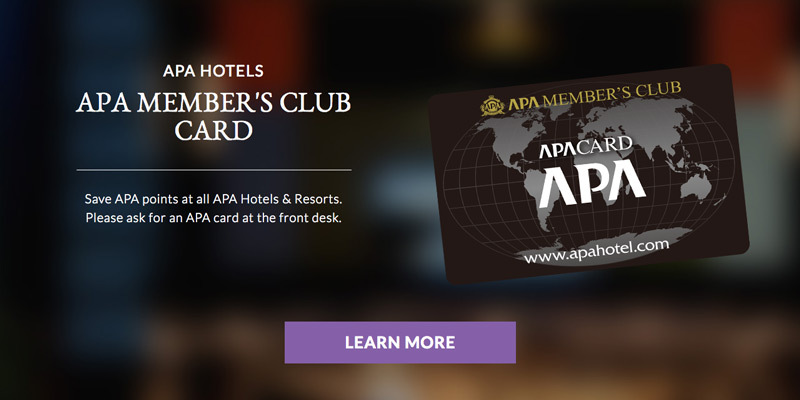 Our goal for the new website was to evoke a more sophisticated angle for APA Hotels. We achieved this by utilizing the brand’s gold and purple colors tastefully throughout the website. Brand colors were used to highlight key items like CTAs and headlines in a more subtle, yet purposeful, way. 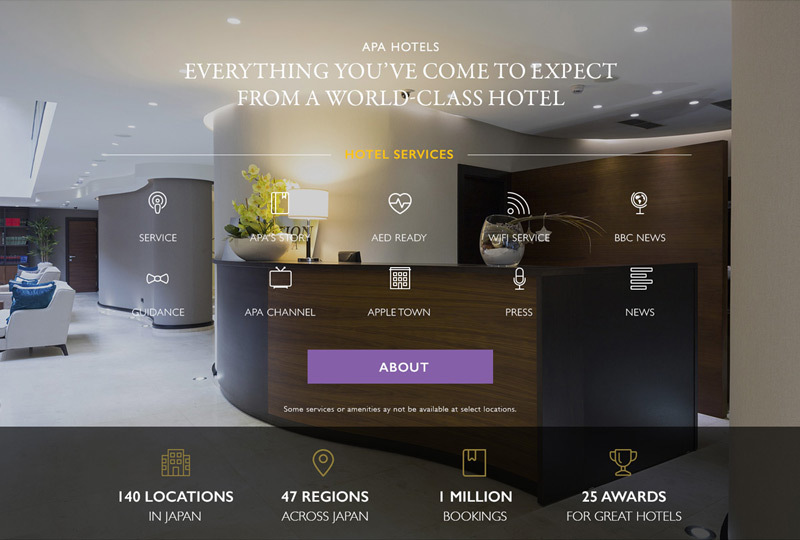 An interactive map, located at the top of the homepage, showcases APA’s main offerings in Japan and improves the website’s ability to help visitors find their hotel quickly and easily. However, foreigners don’t always understand the geography relevant to their travel itinerary. For that reason, we implemented a secondary search, with drop-down menus and autofill functionality available right below this map. Why should users stay with APA when they can secure a proven and reliable experience at one of the non-Japanese hotels here in Japan? We implemented key content elements on the website to build confidence in the readers as they researched their trip to Japan. Popular locations are listed on the homepage to help customers who haven’t chosen their destinations yet. Visitor reviews from TripAdvisor are integrated into pages to build confidence from 3rd party reviews. Additionally, information about APA’s amenities and statistics about the company are presented with icons and graphics, which are interpreted to be more honest and compelling than plain text on the website. Custom graphics highlight key information on the website, such as APA’s rewards program and their North American locations. These elements bring out more attention to auxiliary content and also provide readers with an easy way to engage via integrated CTAs. APA’s updated English website was launched in Q2 2017 and is actively working to enhance their web presence, online lead generating capabilities, and brand among foreign visitors to Japan. This project was done in collaboration with J. Walter Thompson, Public House, and Maikai, and we look forward to more collaborations in the future. Interested in getting more inbound traffic/conversion for your business? How can HB help us rebrand/redesign? This website utilizes cookies. By continuing to browse, you agree to Humble Bunny’s use of them. Please see our policy page for more details.